HISTORY has told us that great players don’t necessarily make great managers. Some do go on to have decent managerial careers, but how many outstanding footballers can match their days on the park to their time in the dugout? When Bobby Charlton went to Preston North End, they were truly excited about having one of the English game’s great names as their “gaffer”. It didn’t work out and many of Charlton’s peers soon discovered that it was better to call it a day on a glittering career rather than tarnish your good name as a failed manager – John Hollins at Chelsea was a good case of that, a well respected player, 100% dedicated, but not so good at managing people. The fascination with former pros extends well into the non-league network. Too often a club outside the Football League opts for a former big name to manage their team, seemingly in the hope that firstly, that name will attract sponsorship and secondly, draw in players. It is rarely a success and can be costly. ot a captivating pundit by any means. Rangers have been, to quote one journalist in Scotland, “dysfunctional for years”. They are way being Celtic but at least they are back in the top flight after a few seasons fighting off Forfar, Dumbarton and Raith as well as accountants and bankers. Scottish football needs a successful Rangers – and if the truth was known, Celtic needs a competitive neighbour. Some journalists believe that Gerrard’s arrival at Ibrox will “light a fire” under Celtic manager Brendan Rodgers and that it will merely spur the green and white half of Glasgow to even more success. 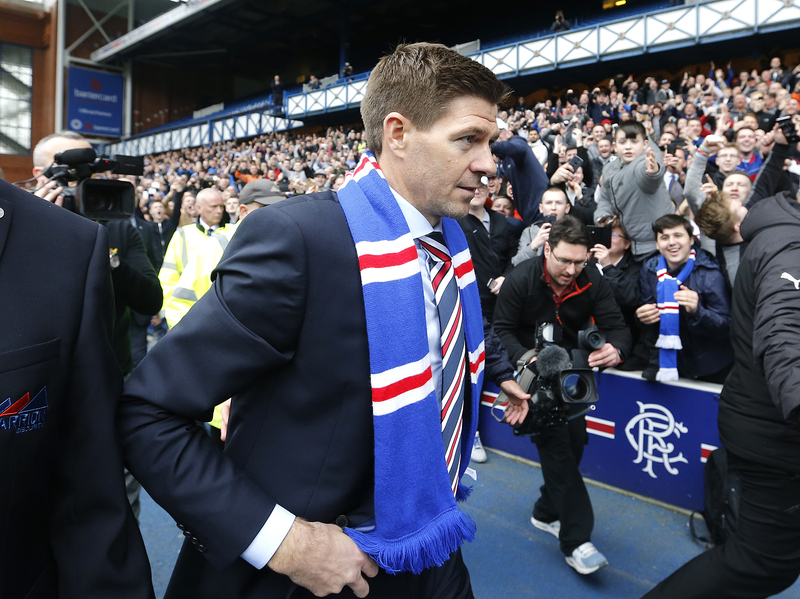 If Rangers see Gerrard’s arrival as the catalyst for a return to glory, they may have a long wait. Anyone drawing a comparison between Graeme Souness’ appointment in 1986 would also be foolhardy. Rangers were backed by serious money in those days and Souness was able to lure top names to the club for that very reason, along with the fact that English clubs were banned from Europe, and he was able to take talent like Terry Butcher, Trevor Steven, Gary Stevens and others north of the border. One leading football writer said Gerrard’s hiring was either “seriously clever or recklessly stupid” and added that one of the big jobs in British football has been given to a “rookie”. “A gob-smacking appointment to rank with any in the history of the Scottish game”, said another – probably a fair assessment given that Rangers’ Dave King said, “That Steven hadn’t managed before was the only box he didn’t tick”. Surely, that was the one box he should have ticked, some might ask? Gerrard has, in the recent past, turned down offers to start his managerial career, but said when Rangers called, it was a “no brainer”. A few days earlier, Liverpool’s fans were urging Jürgen Klopp to appoint him as the successor to the now departed Zelijko Buvac. He may have a culture shock when he starts his new job, though. The Scottish press asked where the money is going to come from to make Rangers more competitive. It is probably that a man who has spent his entire life in or around Liverpool FC may find the “divorce” a little uncomfortable. Furthermore, he will not be “our” Steven Gerrard any more – when things go wrong, he will not be forgiven any shortcomings like he was at Anfield. He has talked of “pressure”, in fact in an interview discussing this new challenge, he spoke about nothing else – how he likes it, deals with it, misses it, welcomes it. If there’s one thing he demonstrated as a player, he was willing to carry his club on many occasions. Still, there are some who think that Rangers have been blinded by the possibilities on a big name, driven by the desperate urge to reassert themselves on the grand stage. It is not out of the question that Gerrard will look to his old club and former team-mates to join him in Glasgow. There is talk of an approach for Dominic Solanke, the former Chelsea bench-warmer who moved to Liverpool a year ago, and reports that Gerrard wants 33 year-old Slovakian central defender Martin Škrtel to return to Britain from Turkey. Doubtless, many others will be linked with Rangers in the coming weeks. Rangers, at present, will be chasing their fierce rivals who have now won seven titles in a row. Gerrard’s inexperience may be tested – his “shape-up or ship-out” warning to his players is straight out of the managerial cliché handbook – but the media activity will help carry him through for a while. Speculation about a new TV deal, boosted by Gerrard’s arrival, is also circulating. There’s one thing that might cloud things, though, and that’s the club’s ongoing financial condition. In 2016-17, Rangers’ losses doubled and it was revealed they needed around £ 20 million to remain a growing concern. In a half-yearly report issued in December 2017, the figures showed a near fourfold increase in losses for the comparable period in 2016. There were rumblings, that have since been denied, that Rangers’ former owner David Murray was planning a return to the club. Glasgow will be eagerly watched both sides of the border in the coming year. Will Gerrard be a success? It’s a tough job for a managerial debut and Rangers have gambled on an untried name. If it is a success, Gerrard will have launched an exciting new career at a huge and influential club, but if it fails, it might be back to that cosy TV studio. Great read! Personally, I don’t really like Gerrard or the Rangers, still I’m keen to see how they’ll do. Previous Entry Wolves are back, but can they become a credible power again?